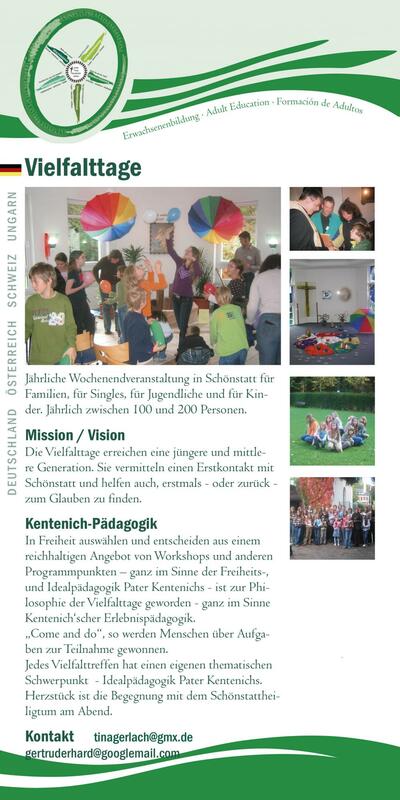 Annual weekend event in Schoenstatt for families, singles, youth and children. Each year between 100-200 people take part. The variety days appeal to the younger and middle generations and in this way attempt to build the future. They have proved their value for people who are making contact with Schoenstatt for the first time, and/or are finding their way for the first time – or returning – to the faith. Choose freely from a rich palette of workshops and other programme points – in the spirit of Fr Kentenich‘s pedagogy of freedom and ideals. Each variety meeting emphasises a certain theme, a central value, which is taken up by the various items on the programme and the workshops – Fr Kentenich‘s pedagogy of ideals. The heart and centre of the variety days is the encounter with the Schoenstatt shrine in the evening.